Today I was driving behind a car with a “Choose Civility” sticker on its bumper and was heartened to see that more and more there is a public embrace of the idea that decency and its sister, humility, are virtues towards which all of us might wish to turn. While we in this country certainly don’t corner the market on arrogance and meanness, we do seem to be at the front of the pack when it comes to using a public forum to word-slay people with whom we disagree. Nowhere has this been more evident than in the media, where people like Rush Limbaugh have for years been able to say any unspeakable thing at any time about anyone–and without consequence. It is no small matter, then, that the tide seems to be turning against the likes of Limbaugh, who over the past few days has lost the support of nine advertisers with his syndicated radio program as well as the backing of key Republican leaders because of hateful remarks he made about Georgetown law student Sandra Fluke. In another incident, an ad telling the President of the United States to “go to hell” because of his healthcare reforms has gone up in a DC Metro station, and this display of hate mongering is also causing quite a stir. I confess that I take great pride in being on the side of virtue whenever I am on the side of virtue. I am also more than a little gleeful that Limbaugh is finally getting his comeuppance. But, I have to come clean here. In my last post, a piece about the Good Wife, I wrote something about Julianna Margulies that was mean spirited and that could have caused harm. At the time, I told myself it was an important detail, but, honestly, it offered nothing except a testament to my capacity for cruelty. Fortunately, my conscience woke me up in the middle of the night and compelled me to delete the offending sentence. 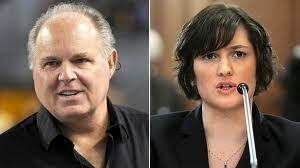 There is a sad truth here, though: When left to my own devices, I can become a Rush Limbaugh, if only by degrees. how very true! It is so much easier to vilify than to come up constructive comments.